While in Copenhagen in November 2007 Dean & Britta Friday evening at the Studenterhuset with guest spots from a couple of luminaries of the Danish indie scene. Most notable of these was Nikolaj Nørlund (who as well as being a solo performer is in the band The Rhonda Harris and is a producer). 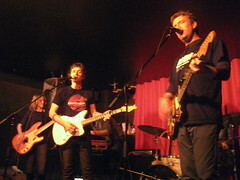 Nikolaj joined Dean & Britta for their last song of the evening, a cover of Galaxie 500's cover of Joy Division's Ceremony.